Bastick12 described effective interactive teaching as maximizing lecturer/student course satisfaction and students’ educational attainment. Changes in the instructional strategies of the lecturer are needed to monitor the progress of students and capture their understanding so that deficiencies can be rectified in order to improve students’ academic scores and overall satisfaction. The ARS used in this study is PollEverywhere (http://www.PollEverywhere.com). It is considered one of the best for a number of reasons as it overcomes many of the stated drawbacks of other types of ARS. The lecturer does not need to worry about decreased lecture coverage, wasting time distributing, or collecting handset remote controls at the beginning and end of the lecture, as students respond via their own mobile phones, saving at least 10 minutes every time. It is considered a “wonderful way to incorporate mobile phones in the classroom for learning, rather than battling against them!”.20 Utilizing cell phones as classroom learning tools is worth exploring. There is also no risk of losing a remote control in class avoiding the penalty of paying its cost. 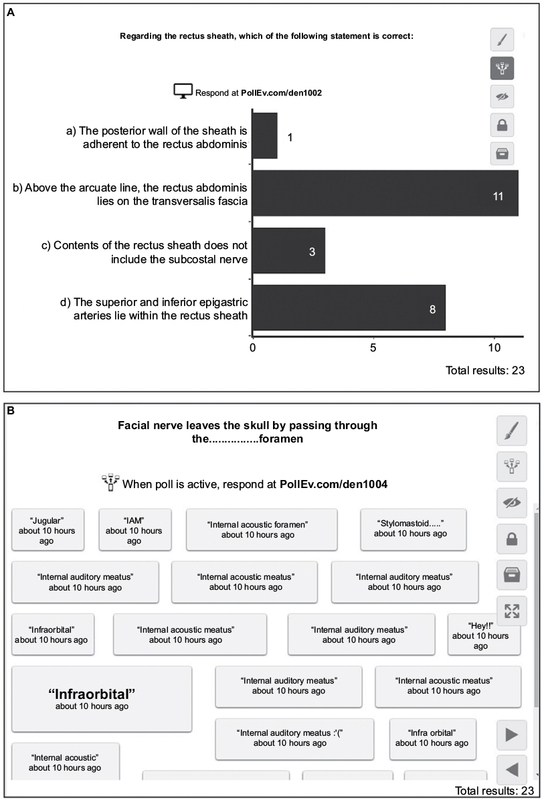 This study contributes to the literature on the different methodologies of effective teaching, especially since mobile-based ARS systems such as PollEverywhere are not well known in the preclinical undergraduate medical and dental schools of the UK and Europe even though it is a highly effective interactive method. Despite reports on the advantages of PollEverywhere ARS within higher education, its utilization is limited and research on its effectiveness on knowledge gain and learning is scarce in the UK and Europe. The aim of the current research focuses on analyzing students’ perceptions of effective interactive teaching using PollEverywhere. This research helps faculty members to gain valuable insights into how to improve their teaching effectiveness. It emphasizes to lecturers that their teaching approaches can have a great influence on students’ learning and engagement. The research explores the use of PollEverywhere in monitoring students’ level and its effect on their attention and interaction in a multicultural university. This study gave students the opportunity to comment on their perceptions of the utilization of PollEverywhere ARS in both survey and focus groups. First-year dental students (N=60) at the School of Medicine, Dentistry and Biomedical Sciences, Queen’s University Belfast (QUB), UK, were invited to participate in this quantitative and qualitative research after getting the approval of the research ethics committee of the School of Medicine, Dentistry and Biomedical Sciences, QUB and taking the consent of students. The quantitative data were collected from the students through completion of a survey. It was clearly mentioned in the information sheet that participation was voluntary and would not affect their studies in any aspect. The information sheet provided, described the project and its aim and explained that if they decided to participate they could skip any question they preferred not to answer and that they could withdraw at any stage. The survey used was to assess their opinion on the use of PollEverywhere as a technology learning method for interaction at the end of their first semester 2015/2016. Respondents were 73.33% female and 26.67% male. The majority of the students (75%) were aged between 18 and 20 years and only 25% were above 20 years of age. The students’ background was recorded under the categories of Home/Northern Irish (NI) (61.67%), Wider UK (13.33%), and International students (25%). A sample of these students was then asked to participate in focus groups to collect qualitative data to further explore the findings of the survey. For comparison and validation, first-year computer science (CS) students (N=133) at the School of Electronics, Electrical Engineering and Computer Sciences, QUB also answered the same survey, based on their experiences using the same technology in their own lectures during the first semester of 2015/2016. This was a sample from a larger class (n=329). While there was full participation in the survey from the dental students, it was felt that this sample was sufficient to validate the findings. The demographic breakdown of the CS respondents was 75.19% male and 24.81% female. Again, the majority (75.94%) of these students were in the 18–20 age brackets with the remainder being above 20 years of age. An overwhelming majority of the CS students (97.74%) fell into the Home/NI student category. One lecturer taught a 12-week human anatomy module to first-year dental students during the first semester 2015/16. It included 36 one-hour dissection sessions and 24 hours of lectures. Attendance of lectures is compulsory for dental students. Anatomy is traditionally delivered to them in the form of lectures, problem-based learning clinical cases and practical classes. During the first weeks of the module, students showed low engagement and low class participation due to their diverse educational and cultural background. The need for improvement was considered. During the sixth and tenth weeks, five anatomy lectures were adapted to include PollEverywhere Audience Response Interactive activities. Dental students were divided into two groups for interactive-based lectures. Each group was 30 students. The lectures were repeated to the two groups on the same day, immediately after each other. Toward the end of every lecture, 10 basic anatomy or clinically applied questions relevant to the topic of the current lecture were used. Some of them were lower order while others were higher order questions that required more consideration, not just memorizing. Students selected their answers using their mobiles, and the results were either displayed on a histogram for MCQs, including both simple and short problem-based questions, or displayed in separate boxes in the case of Fill in the Blanks, Open Response Questions. Samples of these responses are shown in Figure 1. During the construction of the ARS questions, careful consideration was taken to promote problem solving and deeper ongoing retention of information. The result of these polls then influenced the way in which the lecture proceeded. Questions were presented to the students at the end of the lecture to examine postlecture knowledge recall. If the most popular answer was incorrect, the lecturer would spend more time addressing the misconception. Figure 1 Sample responses to MCQ (A) and open (B) question types presented in class. Note: Larger text in (B) indicates more frequent response. Abbreviation: MCQ, multiple choice questions. The number of students answering the questions was displayed on-screen, which helped the lecturer to verify that all students were participating in the interactivity. A time limit of 60 seconds for every question was imposed for students to respond to ensure that the lecture time was used effectively. First-year CS students also undertake a 12-week course taught during the first semester with a total of 22 hours of practical sessions and 36 hours of lectures, though there is no compulsory attendance requirement in their course. They made similar use of the PollEverywhere technology in their lectures but were more familiar with its use across multiple modules, whereas it was totally new for dental students. It should also be noted that in the case of CS students, this technology tended to be used in the full lecture group with potential numbers of 300 or more, rather than the smaller group setting of dental students. The primary research instrument was a structured questionnaire that was a modified version of a previously validated and reliable instrument for measuring student perceptions of ARS.27 Responses to the modified survey were analyzed for reliability and the Cronbach’s alpha coefficient was 0.84, which exceeds Nunnally’s28 threshold of 0.70, suggesting that the instrument is highly reliable. The questionnaire was used to collect data, conduct the investigation, and analyze students’ perceptions of effective interactive teaching using PollEverywhere system. The questionnaire was distributed to dental students at the end of the trial period. Completion of the questionnaire was voluntary. To encourage uncensored answers, students responded anonymously. A brief explanation by the researcher was provided to ensure that the students understood the purpose of the study and were able to choose the appropriate answers for the questions based on their experiences. The quantitative data were then analyzed using the Statistical Analysis ToolPak in Microsoft Excel. The survey assessed the first-year dental students’ opinion and reaction to their interactive lecture experience using the PollEverywhere technology. The analysis was done in a manner that prevents the identification of individuals. The questionnaire comprises of two sections, the first of which gathers respondent’s demographic information, followed by questions about students’ opinion on the interactive teaching. The data were used to compare age, gender and students’ background if national, EU or international with regard to measuring their opinion about the interactive lectures. 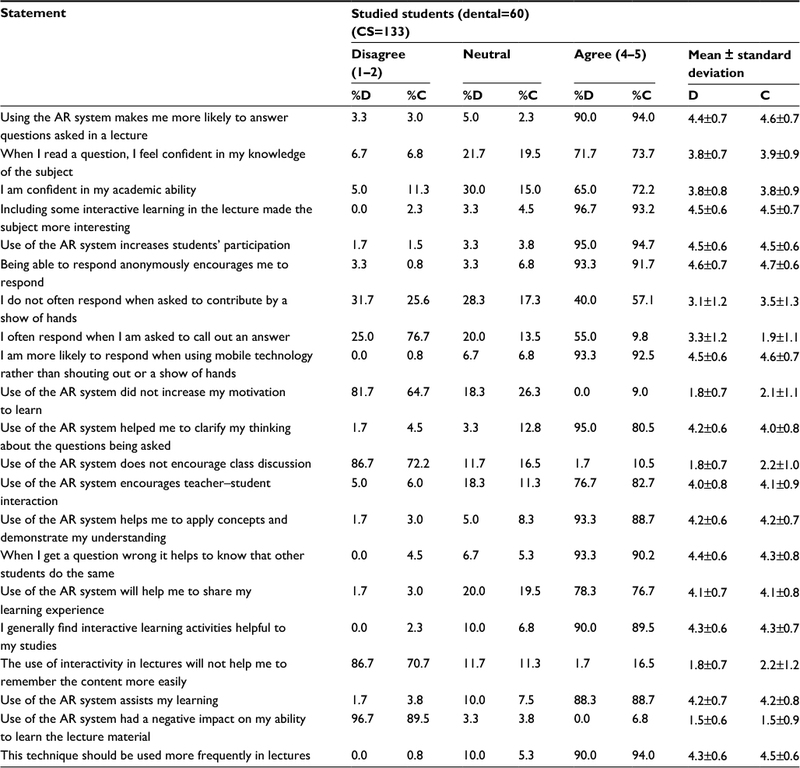 The second section of the questionnaire mainly required students to answer by choosing one of the options ranging from “highly disagree” to “highly agree” on a five-point Likert scale measuring subjective opinion on 21 items within the themes of interactivity and level of engagement in learning, motivation, and usefulness (Table 1). The survey was designed in such a way as to ensure that the scale items suitably reflected the proposed domain.29 Both positive and negative statements were used in the questionnaire. For the negatively framed questions, reverse mean was calculated for use during analysis by using the formula: reverse mean=6−normal mean. The method allows a quantitative evaluation of the responses of individuals to assess their perception of the experience. Abbreviations: D, dental students; C, computer science students; AR, audience response; CS, computer science. This section also included an optional open text question allowing respondents to further elaborate on their response to the statement “The use of this technique will make me more likely to answer in class”. This allowed the gathering of supplementary qualitative data for further analysis. The survey was also distributed among the first-year CS students, who used the same software frequently in their own lectures, to compare the opinion of students in different schools on the use of technological tools for lectures’ interactivity. The information gathered in this study is secured so that it is only accessible to the investigators. The analysis helps to make recommendations for future changes in the teaching methodology. The quantitative raw data were collated into Microsoft Excel. The negatively framed questions were accounted for before starting the analysis. An overall “attitude score” was computed for each respondent based on a mean response to the individual questions. The Statistical Analysis Toolpak within the Excel was used to apply univariate analyses including two-sample t-test and analysis of variance (ANOVA) test to perform a breakdown on demographic categorization to determine whether there was a statistically significant difference in response between age groups, gender, and student background. A P-value was considered significant if it is <0.05. Qualitative data were examined from the open-ended question in the survey using thematic analysis. Conceptual coding of students’ responses was performed, and a frequency analysis of emergent themes was produced. The two investigators initially performed this coding separately and discussion then took place until a coding framework for the themes was agreed upon. All quantitative data were compared between dental students and CS students. 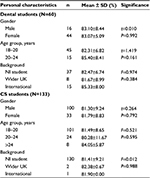 Following initial analysis of the survey data, 24 volunteers representing a convenient sample of dental students that included national, EU, and international students of both genders were invited by blind carbon copy (Bcc) emails to participate in three semistructured focus group discussions, which lasted for 20 minutes each. Maximum sample variation was selected in order to get an almost equal number of female and male students. At least two from each focus group were international students to get an ethnically diverse environment suitable for the in-depth themes. The purpose of these group interviews was to gather more in-depth quotes to supplement the quantitative data. Discussions were held in the lecture theater one after the other. The groups did not listen to the responses of the rest so as not to influence their opinions. Focus groups were used to verify the results obtained from the questionnaire. The focus group data analysis was done after analyzing the quantitative data. Themes were identified, coded, and then sorted into categories. Common themes that emerged from the free text question in the survey included the anonymity and the opportunity to compare their knowledge against other students in a nonthreatening enjoyable and interactive environment. The survey indicated that students felt that this software increases participation/engagement. Students were asked to discuss if they felt that they did not typically engage in the more traditional lectures. Students were asked to compare these interactive lectures with the more traditional ones and discuss the importance of increased student/teacher interaction. Concepts such as confidence in their own knowledge of the subject and interest generated using the two different methods were discussed. Students were asked to reflect on why they felt the theme of anonymity came across so strongly in the survey. They were asked to reflect on whether they felt there was a general fear of speaking out in class and what could be done to alleviate these fears. Does the use of polls suitably address this problem? They were asked to comment on their experiences of using both multiple choice and open text questions as part of the interactive lectures. As attendance is recorded, students were asked do they ever find themselves going to a lecture, only because they are obliged to do so. If attendance were unmonitored, would Polls encourage them to attend? The focus groups were structured to allow students to give their opinion on these topics without prompting or seeking particular responses. The recordings of the focus group discussions were transcribed, and then qualitative analysis was performed on emergent themes, as the transcription convention is practically suited to the purpose of analysis.30 The approach used ensured anonymity of individual student responses. From the analysis of the Likert response to the survey items, it was clear that students preferred PollEverywhere ARS interactive lectures. 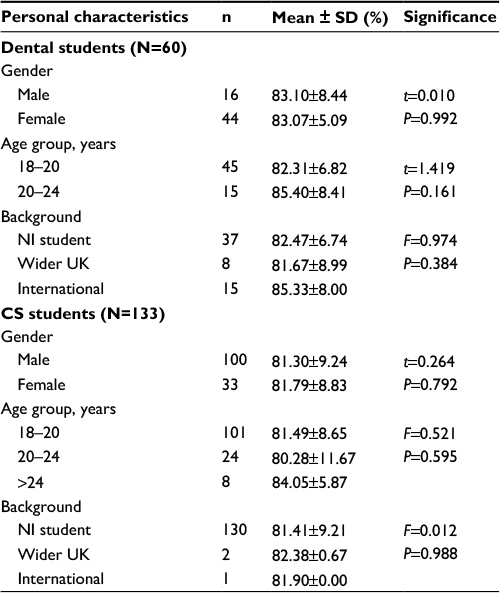 The total mean score of the attitude toward the interactive teaching among the dental students was highly positive (83.08%) with a similarly high mean score for CS students (81.42%) (Table 2). Across both cohorts, the vast majority of students returned an attitude score of moderate or above, i.e., a score ≥75%. Abbreviations: min, minimum; max, maximum. Table 1 shows a per question breakdown of the responses given to the survey statements. Perceived benefits about the usefulness of PollEverywhere technology implemented were obtained via the structured questionnaire. The majority of participants (71% dental and 73.7% CS students) reported a high level of confidence in their subject knowledge. However, anecdotally, it has regularly been noted that despite this apparent confidence in their ability, students tend to be hesitant about answering aloud. The statement “Using the ARS makes me more likely to answer questions asked in a lecture” confirmed that this technology made the students more active and engaged, as 90% of dental students and 94% of CS students highly agreed with it. This was reinforced when the lecturer noticed that most of the students answered the questions. A total of 95% of dental students and 94.7% of CS students highly agreed that ARS increased students’ participation. This technology has also increased the student’s motivation as 0% of dental students and only 9% CS strongly disagreed with the negatively framed statement that the “Use of the ARS system did not increase my motivation to learn”. A total of 95% of dental students and 85% of CS students strongly agreed that it clarified their thinking and helped them to focus on key points. 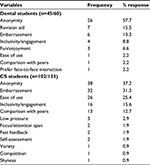 Students found that this system increased their knowledge retention as 86.7% of dental students and 70.7% of the CS students strongly disagreed with the statement “The use of interactivity in lectures will not help to remember the content more easily”. 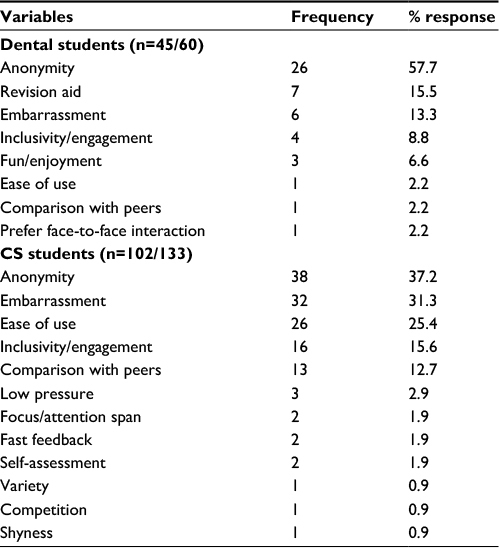 A total of 76.7% of dental students and 82.7% of CS students found that it encouraged teacher–student interaction. A vast majority, 90% of dental students and 94% of CS students recommended that this technique should be used more frequently. For the most part, the responses across both groups were similar. One notable exception was the response to the statement “I often respond when I am asked to call out an answer”. The CS students overwhelming disagreed with this statement while the dental students were more balanced in their response. This seems counterintuitive, given their self-assessment as academically confident; however, there may be other factors at play such as the particularly large lecture sizes. Both cohorts of students in the free text entry questions indicated an intimidation factor was present when asked to speak out in front of their class, but it was clear that this has a much greater impact in the significantly larger class. Analysis of results showed that demographic information had no effect on student’s opinion toward interactive teaching. For the personal characteristics examined, no statistically significant variation in attitude to interactive lectures was observed. The P-value was >0.05 in all cases (Table 3). In general, students across all categories responded very positively to the use of the software, with attitude scores averaging greater than 80% for all demographics, in line with the overall mean scores already discussed in Table 2. Abbreviations: CS, computer science; NI, Northern Irish. The survey also contained an open-ended question allowing students to elaborate on their reasoning for whether or not the use of software would make them more likely to respond in class. Overwhelmingly, it was said that it would make them more likely to respond and the qualitative data from this open-ended question was analyzed using thematic analysis. Students’ comments across both cohorts are coded to identify emerging themes, and the frequency and distribution of these themes are shown in Table 4. Across both groups of students, anonymity and embarrassment about speaking out were cited as their strongest motivation for the use of the software. The CS students had a significant number of responses related to ease of use, perhaps reflecting their particularly larger class sizes and a preference for this method of response as opposed to shouting out. There is a degree of category overlap in the coding of responses in particular between anonymity and embarrassment. The codes reflect the student usage of the terms where some used them interchangeably and others used both to refer to slightly separate concepts. The response rates presented in the tables were calculated as a percentage of those who elected to answer the optional question, rather than overall cohort size. While coding of the emergent themes across the two student cohorts resulted in some unique responses, in both cases the most frequently arising themes were common. The frequencies of the most popular themes are compared in Figure 2. Anonymity and embarrassment were highly cited themes for both cohorts. However, CS students were found to raise a specific concern about embarrassment more frequently than dental students. This is likely related to the fact that their class size was so much larger and the fear of public speaking factor common to both groups was more pronounced in this circumstance. Figure 2 Comparison of frequency of main themes raised by students in the open question. Students’ feedback comments on PollEverywhere were transcribed and analyzed to supplement the findings from the survey. A representative sample of student comments on identified themes is presented with discussion for consideration. Students were asked about their opinion and impression of the interactivity introduced by using the PollEverywhere System, its impact on their learning, and whether these interactive lectures were more preferable than the traditional ones. There was a general feeling that the use of interactive questions tended to help in focusing students’ attention that was not always present in a traditional lecture. Given the high degree of importance placed on anonymity in the survey, students were asked to elaborate on why they supposed that came across as such a strong theme. The students cited fear of being singled out and fear of speaking out in class as important factors. I think it’s maybe the fear of getting it wrong in front of everyone because we all do know each other and there will be judgment passed on you that you’re not that smart compared to everyone. There was also a strong impression that for dental students in particular, they placed a high degree of pressure on themselves to always be seen to know the right answer. They were afraid to be considered wrong in front of their peers. The pressure to answer a question when I am not sure of the answer, I think PollEverywhere is helpful in that because you don’t feel that everyone is looking at you and everyone is judging you for what you say. The benefit of the software for giving an impression of a student’s own understanding of the material in comparison with the rest of their peers in the class also shone through in the comments from the focus group, in line with the survey findings. Sometimes seeing those polls, it’s your chance to see how the class is doing. You really have no idea where everybody else is and that’s the first time to see if everyone is really learning or where your standard is amongst others. Emergent themes, not already highlighted by the survey included a discussion on the relative merits of MCQs versus open response questions. Some students preferred whichever style most closely resembled what they would expect to see in future exam as they viewed the questions as focused revision. Others preferred a mixture of both but recognized that the open-ended questions had a greater opportunity for self-assessment and reflection of their current knowledge levels. With multiple choice questions you tend to rely on what you can pick of the four choices, so you have a 25% chance of getting each question right. Fill in the blanks requires you to have more knowledge so it’s good to have a mixture of both types of questions. I preferred the fill in the blanks questions because it suits more with the style of the exam. There was also a discussion with the dental students on whether or not, if attendance of lectures were optional, this method would encourage them to attend. Many commented that they felt the software provided some benefits to their study (as opposed to independent self-directed learning). However, these were no consensus on the hypothetical impact on attendance as students felt this would ultimately come down to individual learning styles and preferences. It can be a confidence builder but also quite a wake-up call to know how far you are in terms of keeping up to date with the knowledge. It can be used in revision. Obviously it increases the interactivity between the lecturer and the students as a whole. I think for me it would encourage me to attend a bit more, whereas with the lecture you can read the content for yourself at home. Broadly speaking, the comments raised by the students were consistent across the three focus group panels. PollEverywhere technology was reported to be a major facilitator of learning as it allowed them to participate and answer without being identified and gave them flexible options to participate. It also guided them to further understand some information and helped focus their revision. The introduction of PollEverywhere ARS in the anatomy module for dental students provided an opportunity to measure knowledge gain using the display screen in the lecture hall. It was used to keep track of student’s progress, teach, motivate, and measure students’ learning and encourage less-confident students to be more willing to participate anonymously. It helped to achieve a better insight into students’ understanding of the concept that was accelerated by including real-time assessment in class. Putting mobile phones and computers to work as learning enablers, not distractions, created a fun and engaging learning activity that encouraged students to participate more and held students’ attention and focus longer. The investigators noticed that students demonstrated great enthusiasm in class and they requested the use of PollEverywhere technology in every session. Their engagement and attention increased gradually after the first question as noted from the number of responses displayed on the screen. This helped the lecturer to rapidly assess the audience’s knowledge and determine whether they had a basic understanding of key concepts. Knowing the number of respondents, students who did not participate were encouraged to do so in the following questions. Reluctant students were motivated to interact since responses were anonymous. The lecturer was gradually able to encourage every single student engage by the help of the technology used and the ability of the teacher to motivate them. This would have been very difficult in any other interactive method. This system helped to focus better on key points, provide immediate feedback to the entire class thus strengthening the learning of important concepts, allowing students to pick up misunderstandings, and aiding knowledge retention. It also helped to identify areas for further development. PollEverywhere technology had the potential to improve the learning experience and to increase interest and enthusiasm. The lecturers are themselves the researchers of this study. They felt that the PollEverywhere format assisted them in enhancing their teaching, in adjusting pace, and in gauging its effectiveness. PollEverywhere technology was a common theme in end-of-year course evaluations as an example of a beneficial tool the lecturer used which others should consider. Students mentioned that it opened a track for discussion and improved their quality of learning. It improved their understanding as well as their critical thinking. This study provides a brief discussion on the encouraging and wide reaching potential of the PollEverywhere ARS strategy. The consistency of the attitude scores for most questions asked in the survey is indicative of the satisfaction of the students. Using PollEverywhere technology in lectures was an effective teaching method and emphasized the value of interaction and engagement. The positive feedback from students was encouraging as it showed that they enjoyed utilizing this technology and found it a worthwhile teaching methodology. Based on the students’ opinions and the experience of the lecturer, it was found that this technology made lectures more interactive, student-centered, and effective. From the lecturer’s personal viewpoint, it helped to clarify the information that was misunderstood by students on the spot. The questions tested a variety of responses ranging from cognitive knowledge to problem solving. Cognitive knowledge was examined by asking direct questions and by incorporating several questions while examining a clinical case. Problem scenarios were also used to challenge students’ clinical reasoning skills and deep learning. This method motivated students to find the answer in relation to a clinical situation. If students’ answers revealed lack of comprehension, the lecturer could deal with that immediately. In addition to this, time was not lost on topics already understood. The relation between students and teachers have improved because of the PollEverywhere strategy, as reflected by students’ answers on the questionnaire, comments from the focus groups, and end-of-semester course evaluations. Lecturers teaching both dental and CS students were pleased with the PollEverywhere ARS strategy and its results in improving classroom attention, as the number of students who participated appeared on the screen confirming that most of the students were attentive and participated in solving the questions. Keeping students attentive improved their learning. They found that it encouraged a high level of student engagement. The PollEverywhere open-ended question type proved best for class discussion and debate. This gives greater flexibility and freedom to create discussions that are more engaging. This type of question cannot be provided by the standard, keypad-based ARS systems. These experiences are in line with recent American literature regarding the benefits of using ARS in higher education, although very few have explored the added benefits of PollEverywhere specifically. As in the faculty survey performed by Slain et al,32 this study found that there can be a tendency to cover less material overall in an ARS lecture as time needs to be sacrificed to allow for the interactivity. However, particularly when used for periodic revision purposes, the net benefits to student learning are clearly evident. Mobile personal response systems can increase students’ engagement during the lectures, and this has been validated in this research.33 It is a way to share the learning experiences of the students and is a method that allows for anonymized feedback. Consequently, lecturers can modify aspects of the module in reaction to the students’ learning needs.20 Students, even those who actively participate may worry about feeling as if they are the only student who does not understand a concept. Using an anonymized poll helps the lecturer to identify those areas of concern. This system could potentially be used in this way by creating a poll with an open-ended statement (rather than a question with an expected answer) such as “I am concerned about[…].” Then aspects of the course can be adjusted based on students’ comments. It is a very transparent way to reflect on the tutor’s teaching and practices. Particular uses for a mobile personal response system in a face-to-face session can stimulate further ideas for their effectiveness in online and blended courses.34 Because it is an anonymous response, it signifies as a pedagogical motivator for getting a response from students. This type of engagement makes all students feel that they are included in the activity. The anonymity of the poll appears to have provided comfort for students to express themselves. Mobile personal response systems not only enhance student engagement but also allow for formative assessment opportunities or homework. The results could also be viewed in the next lecture to discuss areas of difficulty. Some educators have demonstrated that students in ARS lectures performed significantly better in examinations, scored better on analytical questions, and were more satisfied with their learning experience than did students from traditional lecture sessions. Alexander et al37 found that there was a statistically significant positive correlation between ARS and final grades of the students. Students regarded the use of the PollEverywhere technology not only as an amusing novelty but also as an effective teaching innovation. Through the student responses, it was found that strategically placed poll questions throughout lectures helped students to be more attentive and be more motivated to study. Feedback from these questions allowed the lecturer to modify lectures to focus on areas of deficiency and difficulty and give instantaneous feedback. It provided a direct way to see if learning is taking place. PollEverywhere technology was greatly accepted by students though it needs a lot of preparation by the lecturer. It enhanced active learning in large group teaching (dental and CS students). The combination of different quantitative and qualitative student feedback with a consistent picture of positive opinion increases confidence in the interactive method used. It helped students to have a clear picture of what they need to know, what they are able to answer, and what they should improve. They found that this technology made classes more interactive and remarked that they would be happy to use it in other modules. Adjusting lectures to suit this method can lead to prioritization of contents and redirecting lectures toward key concepts. This research recommends that other dental and medical schools in UK and Europe implement this educational approach for dissemination of good practice. This can also open the way for other research to compare analyses of perception for students using this technology in different universities. Hutchings B. Principles of Enquiry-Based Learning. Centre for Excellence in Enquiry-Based Learning, University of Manchester; 2006. Available from: http://www.ceebl.manchester.ac.uk/resources/papers/ceeblgr002.pdf. Walsh S. Exploring Classroom Discourse Language in Action. Oxon: Routledge; 2011. Hall JK, Verplaetse LS. Second and Foreign Language Learning through Classroom Interaction. Mahwah, NJ: Lawrence Erlbaum; 2000. Gulpinar MA, Yegen BC. Interactive lecturing for meaningful learning in large groups. Med Teach. 2005;27(7):590–594. Berk RA. Survey of twelve strategies to measure teaching effectiveness. Int J Teach Learn Higher Educ. 2005;17:48–62. Okpala CO, Ellis RR. The perceptions of college students on teacher quality: a focus on teacher qualifications. Education. 2005;126:374–383. Colker LJ. Twelve characteristics of effective early childhood teachers. J Natl Assoc Educ Young Children. 2008;63:68–73. Mohidin R, Jaidi J, Sang LT, Osman Z. Effective teaching methods and lecturer characteristics: a case study on accounting students at University Malaysia Sabah (UMS). Eur J Soc Sci. 2009;8:21–29. Cannon RA, Newble D. A Handbook of Teachers in Universities and Colleges: A Guide to Improving Teaching Methods. 4th ed. London: Kogan Page; 2000. Bender T. Discussion-Based Online Teaching to Enhance Students Learning: Theory, Practice and Assessment. Virginia: Stylus Publishing; 2003. Bastick T. 3 AF: the three-ability framework for assessment in tertiary education. J Higher Educ. 1995;16:267–278. Bluic AM, Goodyear P, Ellis RA. Research focus and methodological choices in studies into students’ experiences of blended learning in higher education. Internet Higher Educ. 2007;10:231–244. Prober GC, Chip H. Lecture halls without lectures – a proposal for medical education. N Engl J Med. 2012;366(18):1657–1659. Harden R, Laidlaw J. Be fair to students: four principles that lead to more effective learning. Med Teach. 2013;35(1):27–31. Sikarwar AS. Flipped classroom with PollEverywhere: engaging students with active learning in large group settings. J Asian Sci Res. 2015;5(2):111–119. Fies C. Classroom response systems: a review of the literature. J Sci Educ Technol. 2006;15:101–109. Cain J, Robinson E. A primer on audience response systems: current applications and future considerations. Am J Pharm Educ. 2008;72(4):77. Caldwell JE. Clickers in the large classroom: current research and best-practice tips. CBE Life Sci Educ. 2007;6(1):9–20. Gewirtz S. Make your library instruction interactive with PollEverywhere: an alternative to audience response systems. Coll Res Libr News. 2012;73(7):400–403. Herb S, Laurie S. A review of PollEverywhere audience response system. J Technol Hum Serv. 2011;29:236–245. Kolb L. Toys to Tools: Connecting Student Cell Phones to Education. Arlington, VA: International Society for Technology in Education (ISTE); 2008. Stehling V, Bach U, Richert A, Jeschke S. Teaching professional knowledge to XL-classes with the help of digital technologies. In: ProPEL Conference Proceedings; 2012; Stirling, UK. Clark RE. Media will never influence learning. Educ Technol Res Dev. 1994;42:21–29. Trapskin PJ, Smith KM, Armitstead JA, Davis GA. Use of an audience response system to introduce an anticoagulation guide to physicians, pharmacists, and pharmacy students. Am J Pharm Educ. 2005;69(2):28. Medina MS, Median PJ, Wanzer DS, Wilson JE, Nelson E, Britton ML. Use of an audience response system (ARS) in a dual-campus classroom environment. Am J Pharm Educ. 2008;72(2):38. Siau K, Sheng H, Nah FH. Use of a classroom response system to enhance classroom interactivity. IEEE Trans Educ. 2006;49:398–403. Nunnally J. Psychometric Theory. New York: McGraw-Hill; 1978. Rattray J, Jones MC. Essential elements of questionnaire design and development. J Clin Nurs. 2007;16(2):234–243. Edwards JA. Principles and contrasting systems of discourse transcription. In: Edwards JA, Lampert MD, editors. Talking Data: Transcription and Coding in Discourse Research. Hillsdale, NJ: Lawrence Erlbaum Associates; 1993:3–31. Stewart M. Understanding learning: theories and critique. In: Hunt L, Chalmers D, editors. University Teaching in Focus: A Learning-Centred Approach. London: Routledge London; 2013:3–121. Slain D, Abate M, Hodges BM, Stamatakis MK, Wolak S. An interactive response system to promote active learning in the doctor of pharmacy curriculum. Am J Pharm Educ. 2004;68(5):117. Hwang C, Lacroix D, Usova T. Mobile responses systems: a fast and easy interactive tool. Feliciter. 2012;58(3):119–121. Abbott S. What influences student participation in asynchronous online discussions? Learn City J. 2013;3(1):33–44. Dixson MD. Creating effective student engagement in online courses: what do students find engaging? JSOTL. 2010;10(2):1–13. Kappers MW; Embry-Riddle Aeronautical University. PollEverywhere! Even in the classroom: An investigation into the impact of using poll everywhere in a large-lecture classroom, presented at the American Society for Engineering Education. In: 121st ASEE Annual Conference and Exposition, paper ID p 8854; 2014; Indianopolis, IN. Alexander CJ, Crescini WM, Juskewitch JE, Lachman N, Pawlina W. Assessing the integration of audience response system technology in teaching of anatomical sciences. Anat Sci Educ. 2009;2(4):143–197. Poirier TI. A seminar course in contemporary pharmacy issues. Am J Pharm Educ. 2008;72(2):30. Schackow TE, Chavez M, Loya L, Friedman M. Audience response system: effect on learning in family medicine residents. Fam Med. 2004;36(7):496–504. Pradhan A, Sparano D, Ananth CV. The influence of an audience response system on knowledge retention: an application to resident education. Am J Obstet Gynecol. 2005;193(5):1827–1830. Johnson JT. Creating learner-centered classrooms: use of an audience response system in pediatric dentistry education. J Dent Educ. 2005;69(3):378–381. Miller RG, Ashar BH, Getz KJ. Evaluation of an audience response system for continuing education of health professionals. J Contin Educ Health Prof. 2003;23(2):109–115.